Main entrance to the Market Arcade and Victorian Market, Inverness. The original 1870 entrance to Inverness's Victorian Market is on Academy Street, which used to be the town's main shopping street. Strategically located nearly opposite Station Square, it is still the most prominent entry point to this large covered market, which replaced earlier open markets here. The grand neoclassical structure was designed by William Lawrie (c.1821-1887) of the local architectural partnership of James Matthews (1819-1898) and Lawrie. An "ashlar screen," as John Gifford describes it (200), it has Corinthian columns forming the three central arches, with sculpted keystones, a dentilled cornice, a balustrade at the top with corner stands displaying urns, and a central flagpole. There are matching window-arches, balustrades and urns on the wings. The keystones of the Academy Street arches, carved with animal heads: at the top a bull's head, and to left and right rams' heads, their curly horns echoed in the scrolls at either side. 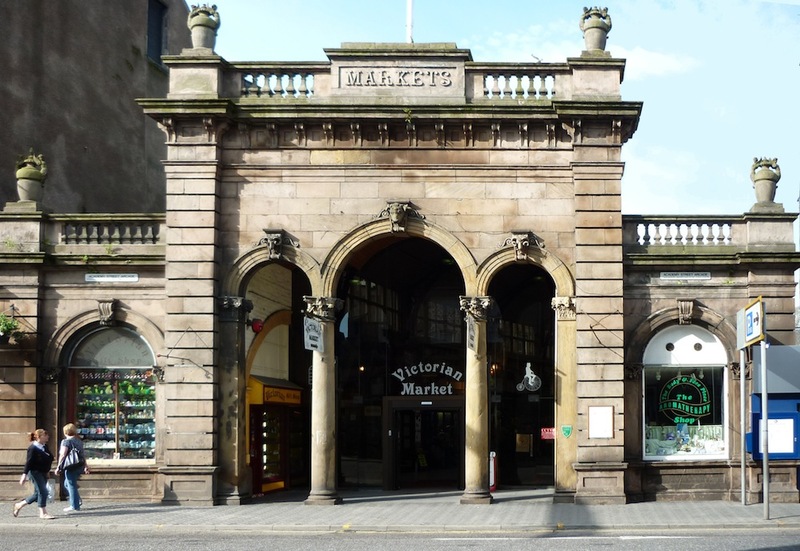 This elaborate portal survived when the gaslit market was destroyed by fire in 1889, but more entrances were needed when the market was rebuilt and extended by the Burgh Surveyor in 1890-91. The new larger complex, including a market hall and fish market, linked Academy Street with Church Street (which runs parallel to it, towards the River Ness) and Union Street and Queensgate on either side, covering a roughly rectangular area. The entries from these streets also lead through arcades to the central hall. 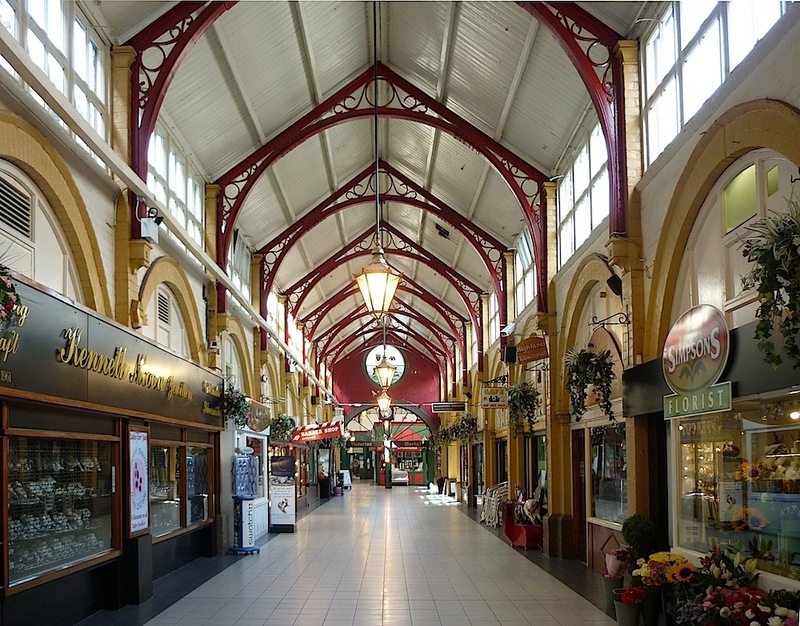 Other architects involved in the later period were Ross and Macbeth, who designed the arcade to Union Street (1890). Later, Duncan Cameron (d.1899) was responsible for the arcade to Queensgate (1897). 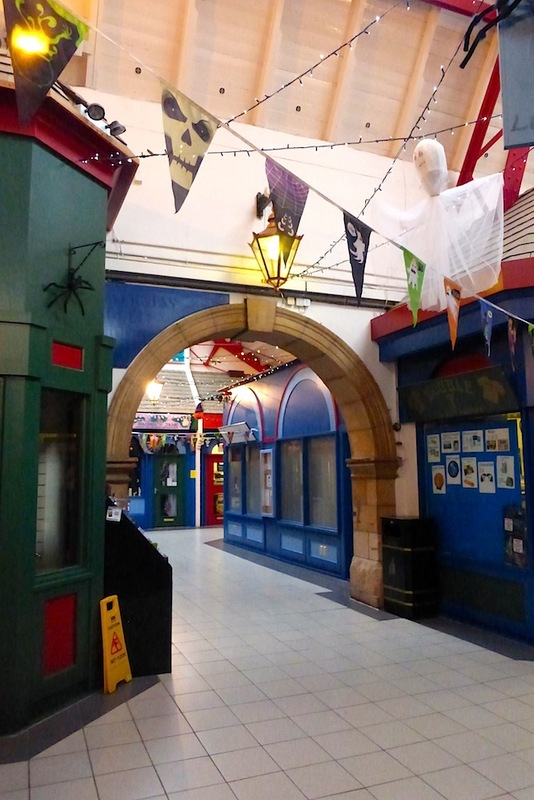 Left to right: (a) Looking along the Academy Street arcade. (b) Useful historical information on a plaque above the market superintendent's office. (c) Arriving at the central hall: the market clock. The curved wooden roof is supported by ornamental cast-iron arches, and the arcade is well lit during daylight by large clerestory windows. A round window over the market clock credits the various bodies that have funded the market, including the "Inverness Common Good Fund." 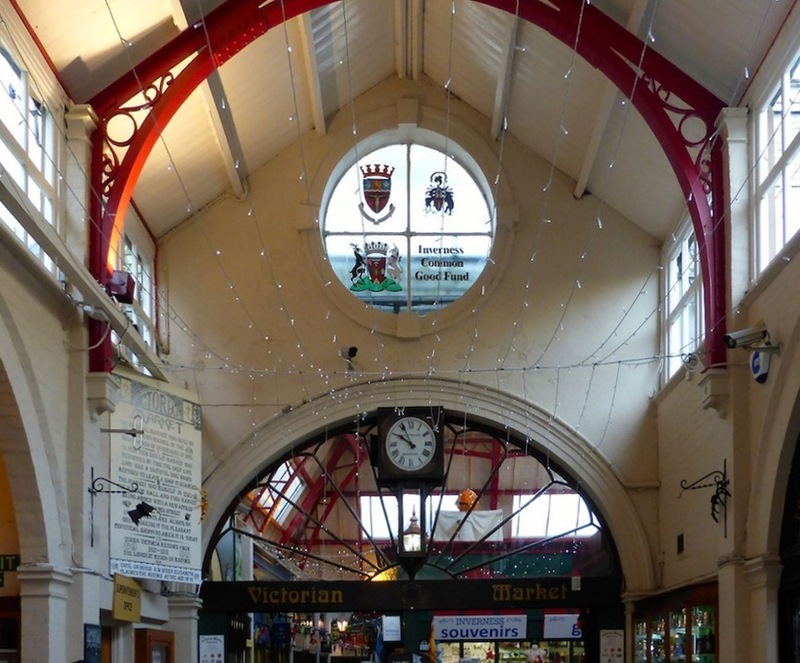 The clock itself welcomes visitors to the large wood, glass and iron central hall of the market. Here, temporary trestles could be put up; but these but could also be cleared away so that the space could be used for special events like performances, flower shows, or any large gatherings (see "Victorian Market, Inverness"). 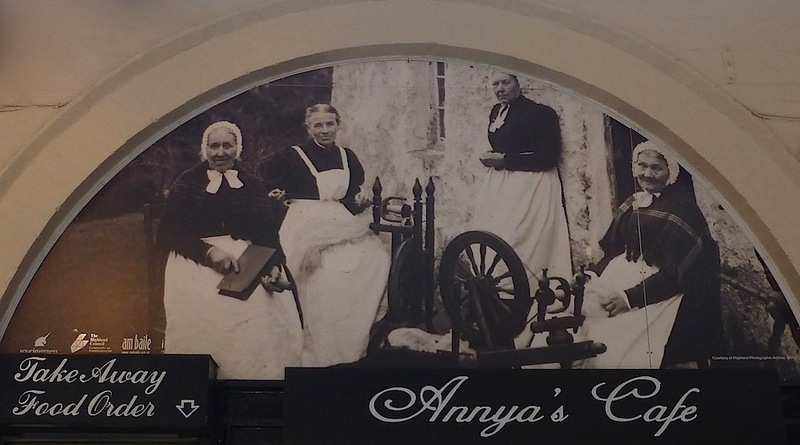 Over a cafeteria-front, a memory of the Highland women at their spinning wheels in days gone by. Inside the Academy Street entrance are arcaded shop-fronts, their semi-circular heads filled with representations of old Inverness, clearly taken from historic photographs. Life is very different now. At the present time (2017), the market has some forty shops and two cafeterias and sells a great diversity of produce (see "Victorian Market"), including goods not usually seen south of the border, like bagpipe supplies and venison. Left: One of the sandstone arches linking parts of the market. Right: No. 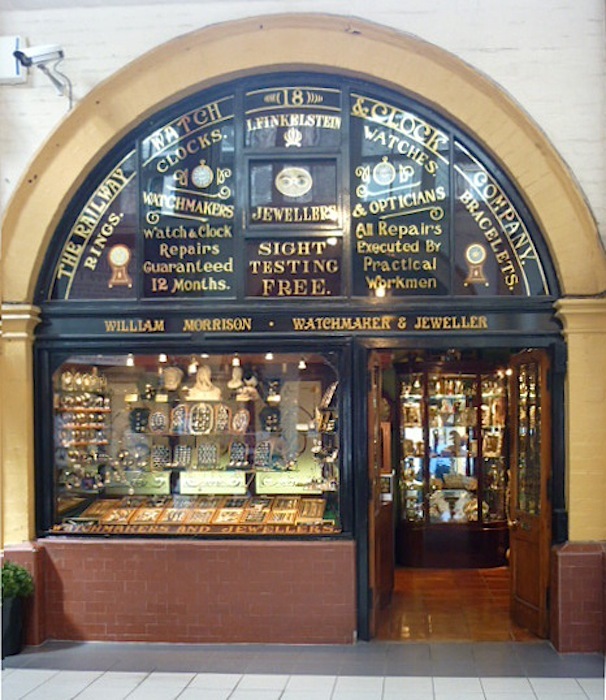 18, The Railway Watch and Clock Company's shop. "Alexander Ross." DSA (Dictionary of Scottish Architects). Web. 30 December 2017. "Duncan Cameron." DSA (Dictionary of Scottish Architects). Web. 30 December 2017. "Inverness, Academy Street, New Market." British Listed Buildings. Web. 30 December 2017. "Inverness, Academy Street, New Market, 13a Market Hall." British Listed Buildings. Web. 30 December 2017. "Matthews and Lawrie." DSA (Dictionary of Scottish Architects). Web. 30 December 2017. 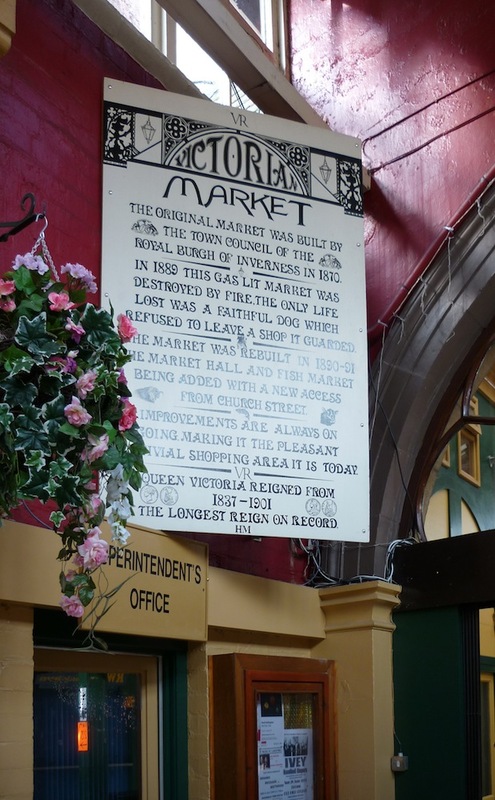 "Victorian Market." Explore Inverness. Web. 30 December 2017. "Victorian Market Inverness — View of Clock Area." Am Baile. Web. 30 December 2017.